It was worthy of a Saturday Night Live skit, but Lorne Michaels probably would’ve turned it down. SNL has leaned heavily left since Donald Trump’s election, and the show’s creator and executive producer would’ve understood the humor in how clueless Senate Democrats came across during Judge Brett Kavanaugh’s confirmation hearing – but he probably wouldn’t bring himself to showcase how awful they really looked. Over the four days of hearings – two of which Judge Kavanaugh went well into the night answering Senators’ questions – there were well over a hundred interruptions by protesters. And when Democratic Senators did ask questions, they did their image no good whatsoever. For his part, Kavanaugh was masterful in fielding every question, befitting a confident 12-year veteran of the D.C. Circuit Court of Appeals bench, the second most important court in the country. The American people saw a judge’s judge – he will fairly apply the law, he will honor the Constitution, he won’t make up law out of whole cloth or impose any kind of agenda from the bench. It’s clear, as with Neil Gorsuch, President Trump had hit another home run with a man who’ll be another great justice. For the Democrats, it was just plain ugly. Leading the parade were two committee members who’ve made it no secret they’re running for president in 2020. But it turned out Senate Democrats had gotten clearance to release them several hours prior. Spartacus had lied to us. When she asked him the same question directly the next night he flatly said, “no.” And then … she politely moved on. It was all made up, nothing to see here. Fishing expedition comes up empty. 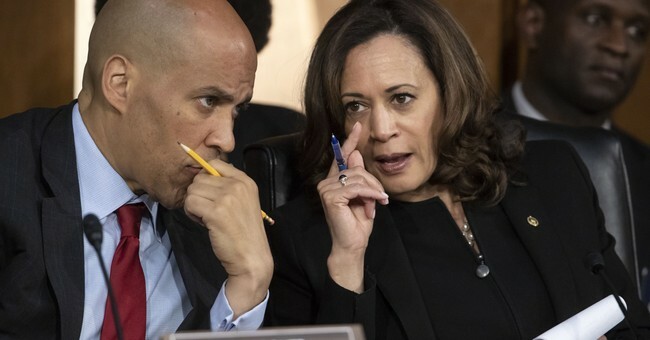 Even the Washington Post noted how both 2020 aspirants “took headline grabbing but shaky steps to put their opposition to Trump and Kavanaugh on full display for the country.” Typically supportive of liberal Democratic leaders, this was the Post’s way of saying Booker and Harris looked more like Keystone Kops than contenders for the Oval Office. While Kavanaugh demonstrated he was ready for the Supreme Court, these two White House wannabes showed they’re clearly not ready for prime time.